Everyone knows that getting around Venice is not easy. With all its “calli”, “campi”, “rii” and “fondamente” is hard to understand where to go without a map or a tool that help you find your way. 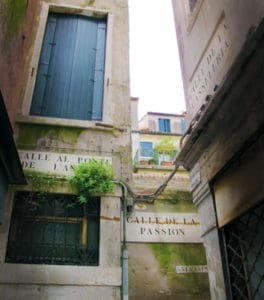 But having a map or an app helping you find your way out of the Venetian labyrinth is not enough if you don’t know the meaning of the Venice toponomy. Here’s why we start our article explaining the meaning of all the words we mentioned before. When in Venice, you won’t hear a single person call a road “street”, just because that is not their right name. “Calle” is the term we use to indicate a street between two walls. Instead, a “fondamenta” is a street that has a canal on one of its sides. If you find yourself walking in a “rio”, you’re actually crossing a street which was a canal in the past. Last but not least, when you see or hear the word “campo” it means that you are in a square, but it’s not called so because the only square in Venice is St. Mark’s Square. So, now that you know how to call all the different streets in Venice, we can suggest you a couple of apps that can help you get around the city easily. You basically will need two apps to visit Venice easily. The first one is Google Maps, which you probably already have on your phone, and the other one is AVM Venezia Official App. Even if Venice is a unique city in the world, with lost of canals and hidden streets, Google Maps is almost perfect, and it can really help you out if you get lost. Of course, when you insert your point of departure and the place you have to reach, sometimes it doesn’t work correctly, but thanks to the maps (that you can also consult when you’re offline) you can find your way out of the labyrinth. The AVM Venezia Official App, instead, is the public transportation app. Here you can find out which vaporetto line you have to take by typing the name of the place you’re departing from and the destination you want to reach, such as an island or a specific area or palace in Venice. You can also buy tickets through the app if you forgot to do it online before your arrival. In the beginning, getting around Venice will probably be difficult, but after a couple of days, using these apps and your memory, you’ll find it easier and challenging too. Don’t you believe us? You just have to try! And if this won’t be enough, you can also read our article about the survival kit you need to live Venice stressfree.